We developed this resource guide to inform and support our community members on the inclusive initiatives taking place at UNI related to gender diversity. We encourage our trans, non-binary, and gender diverse students to use this resource as a guide to life at UNI. We are continuously working to update our resources for students. 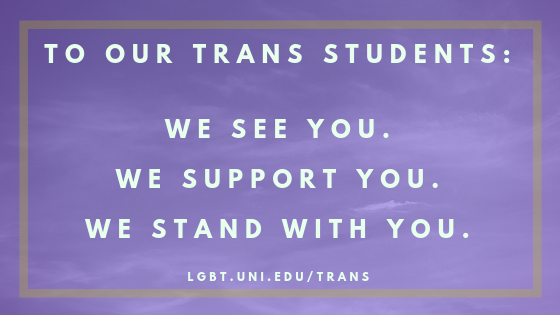 If you have any questions or recommendations for this resource, please e-mail lgbt@uni.edu.